MILWAUKEE – The U.S. Speed Skating’s team pursuit squad will feature a new member, an Oak Park native, on its three-man team in the 2018 Winter Games. Emery Lehman will replace Chicagoan Shani Davis, a five-time Olympian, for the team pursuit in Pyeongchang, joining Glenview’s Brian Hansen and Joey Mantia on the team. 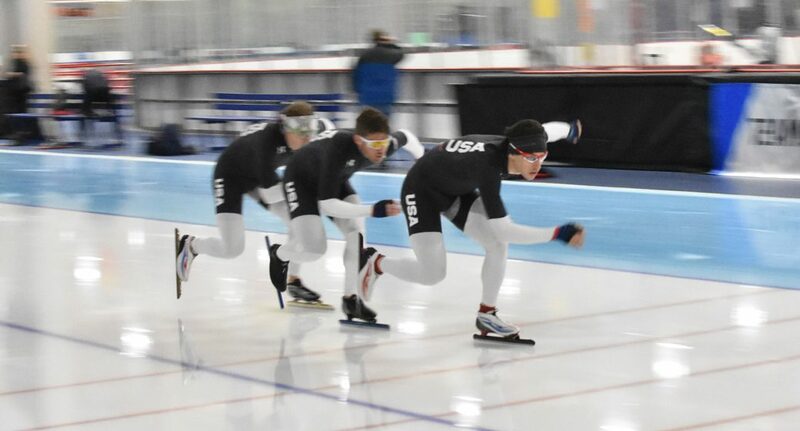 Not that the 21-year-old needed any more pressure, but now he’s tasked with filling the shoes of one of the most decorated speed skaters in U.S. history. Tom Cushman, all-round coach of the U.S. Long Track Speed Skating team, said he and his staff searched for Davis’ replacement during the last two years. Cushman said Lehman won the vacant spot due to the multi-focused approach he has when he trains for the sport. Lehman was an Olympian once before, in 2014, and competed in the 5,000- and 10,000-meter races, finishing 16th and 10th, respectively. In 2018, he’ll be competing in the 5,000-meter and in the team pursuit. The team pursuit event is the more complex of the two. The speed-skating team pursuit event mirrors the team-pursuit events in track cycling; one skater leads the three-man team, while the two following skaters push the skater in front of them. The biggest difference between the team pursuit and 5,000-meter races is the racers in the team pursuit will have help. The U.S. Speed Skating team is trying to recapture its team-pursuit magic from 2010, when Team USA took silver in Vancouver. In 2014, the team-pursuit squad finished seventh, as was expected. Brian Hansen, who’s made the 2010, 2014, and now 2018, team-pursuit squad, said pushing is the most significant technique for the U.S. team. Hansen also spoke highly of Lehman, who joined the team-pursuit two seasons ago, and praised how he’s fit into the last spot on the squad. Both Bleacher Report and the Chicago Tribune both listed Lehman as a “rising star” speed skater in 2014. On his way to his second Olympics, Lehman can take the next step as that rising star in Pyeongchang by improving on the U.S. team pursuit’s seventh place finish in 2014. Lehman doesn’t know what to expect when he’ll compete on one of the world’s biggest sports stages. As Lehman continues to improve his skating skills and speed, there will be disappointments along the way, and he plans to use every moment as a lesson. “There’s a reason for a bad race, and a bad race is still training,” Lehman said.